So I popped out to Primark over the weekend and loaded up on goodies. I figure that because I didn't buy anything from Topshop or River Island, I was a good girl... no matter how much I bought in Primark! 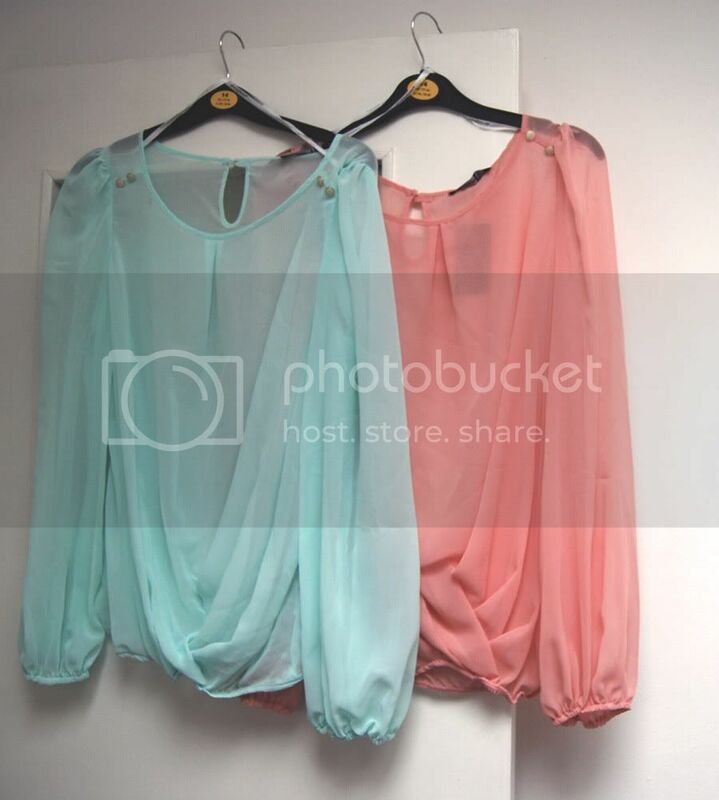 You'll notice a very strong pastel chiffon trend going on here. I can't get enough of it! During LFW, I had a dream that I was wearing my purple Topshop skater dress over a blousson-sleeved chiffon top. Then I saw these beauties for around £8 each. I had an itchingly impatient wait until payday but now they are mine! Rich said they look "very Persian". I think they're going to make me feel like Princess Jasmine. There was a white one too but I think I'll wait until next month and see if they're still around. I also spotted these lovely sleeveless blouses. I'm not entirely sure why the polkadot one has such a long back. It's really irritating me, especially as my measurements really require a longer front! Never mind, I figure I'll always wear it under/ tucked into another piece. The navy striped one I just couldn't resist. I have a great red full skirt that will look so very nautical with this. 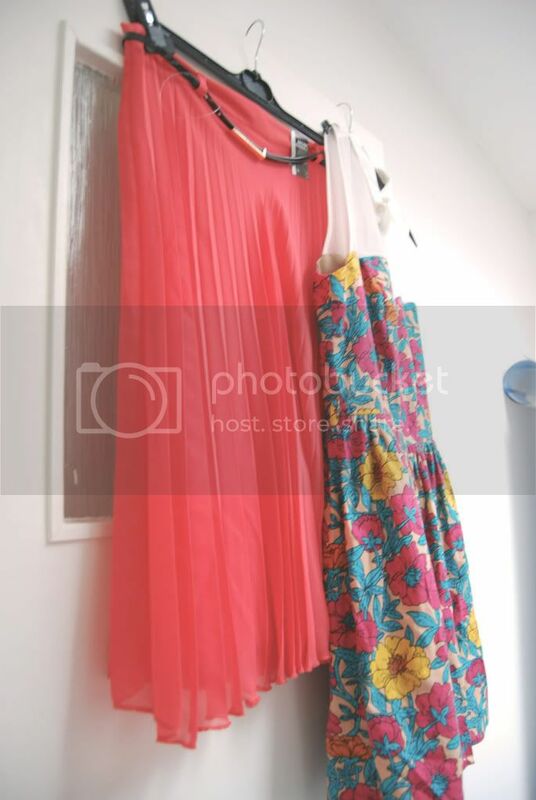 I spotted this coral pleated skirt when I went out with my little brother a couple of weeks ago. I knew it was perfect when I asked for his opinion and he said "Old granny-like". Ideal! 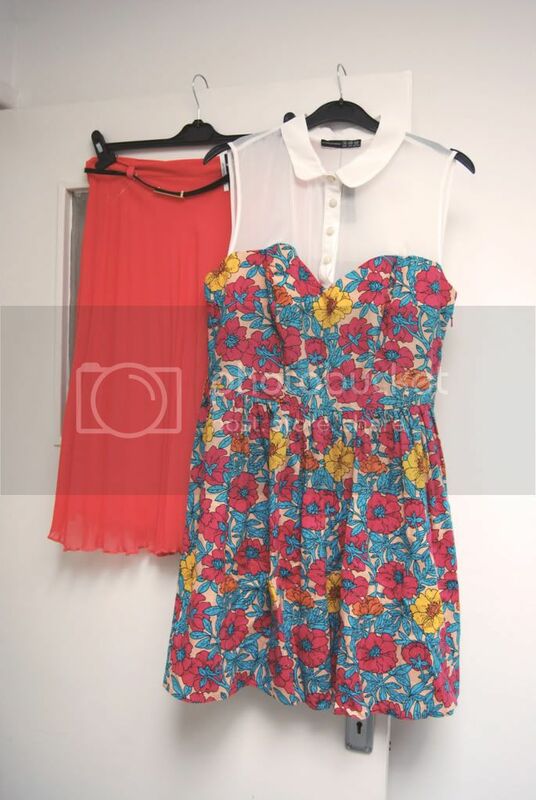 The floral dress was just too pretty to resist although I have absolutely no idea what is going to happen bra-wise! Oh, shoes. Primark shoes are my downfall. I know that their size 6s fit me perfectly and they're always comfy. I only ever wear flat shoes really and since they are around £5 a pop in Primark, it makes it so easy to just throw a pair in the basket. If Rich hadn't dragged me away, I would have walked out with another 3 pairs. At least. 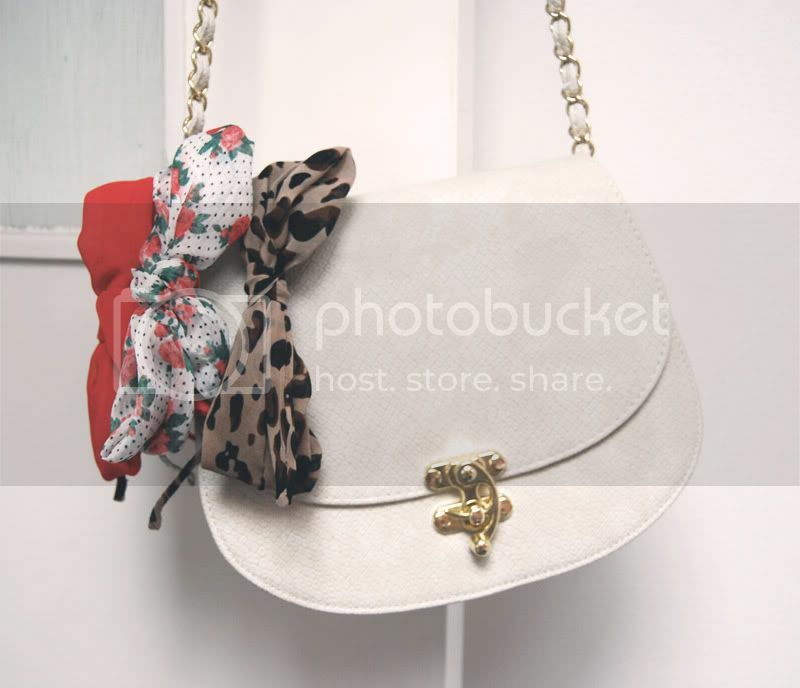 Finally, I got this cute little bag that I don't need but I just love the clasp. 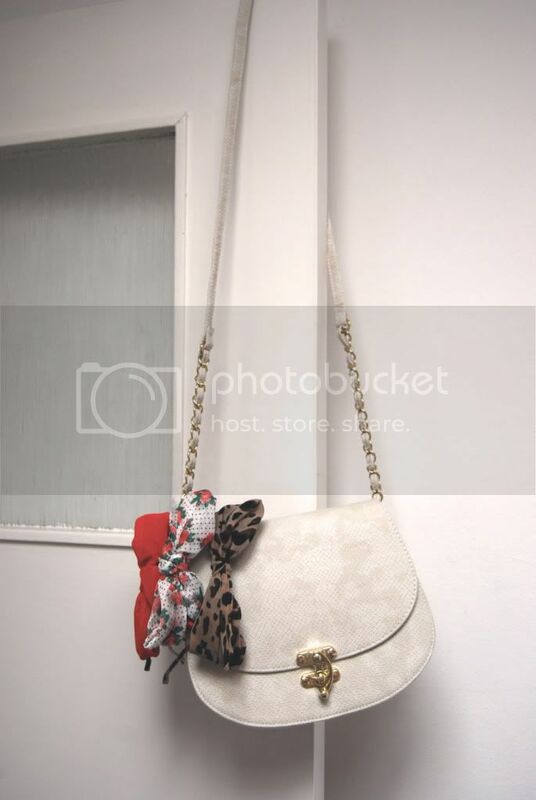 It swivels around and unhooks. The Alice band bows were 3 for 2 in Accessorize. I have heaps of these but I never wear them so I really should start throwing them on. Maybe I'll stick one on tomorrow. Ooh, the leopard print one. Match it with my new shoes. Yeah! Now, I know I bought a lot and it's naughty, but apart from this (and the boots I bought this morning and those Vogue sunglasses I bought and all the Benefit make up I bought the other day) I haven't bought anything else. I don't intend to for the rest of the month either. Beautiful, I love them all! Great blog.... Following you now. Oh my, such great buys! Makes me want to shop right now. 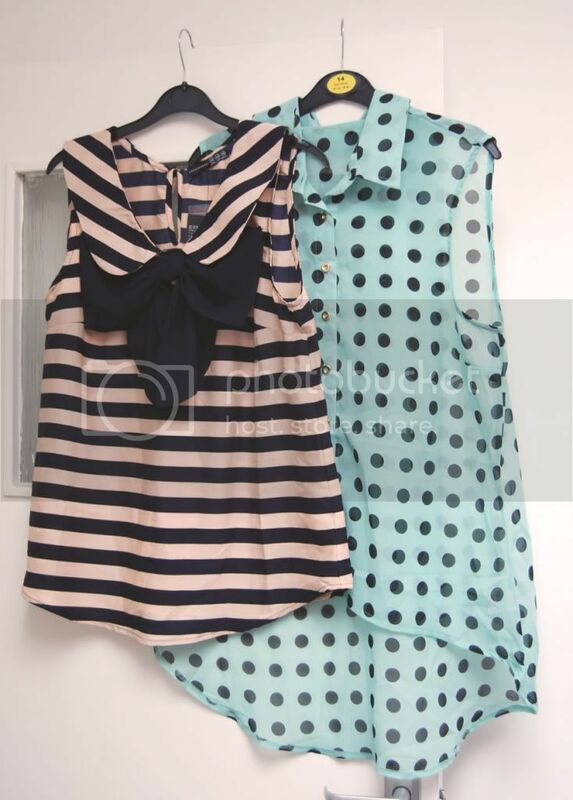 My fav has to be that chiffon blue sleevless with blue polka dots! Love your conclusion : "I haven't bought anything else" !! Maybe if you had your closet would have blowed up !! Why Primark isn't coming to France ? I try to go once or twice a year to a London shopping week-end but that's never enough ... 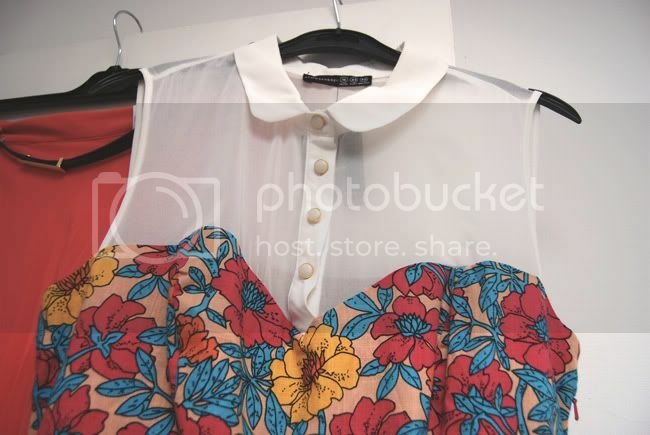 The blouses you bought are sooo great ! I am so jealous, so many new things, I love all of these looks. All your new things are beautiful! Oh my! You got wayyy many cute items!!!! I can't decide which I like best! ALL!!! Love these all! So stunning I want! highly obsessed with everything in this post. reallllly loving the pastel chiffons myself! Those flats are LOVELY !! !